The fourth Gruesome monsters-supplement (for a handy list, use the Gruesome-tag on my homepage) clocks in at 14 pages, 1 page front cover, 1 page editorial/SRD, leaving us with 12 pages of content, so let’s take a look! We begin the collection of templates and creatures herein with the Abandoned construct template, which clocks in at CR+2. And this one’s disturbing. What happens if a shield guardian fails its master? Well, one response would be that a semblance of sentience fuses with the now abandoned construct, making it a twisted inversion of its prior self: A curse is woven into the amulet and we get basically an inversion of the master/servant dynamic: The construct goes on to enslave the living, who obviously quickly burn out in service to their dread construct masters. Thoroughly intriguing and a cool story just waiting to happen! As always, we also receive a mythic template, this time around the Insane Intelligence at CR +1/2 mythic ranks…and it puts new meaning to supra-genius intelligence. These constructs can read anything; hide suggestions in writing; drive you insane by merely talking to you and picking apart yourself. They can almost perfectly predict the outcome of any battle and, worse, are on a direct route to godhood, gaining mythic ranks as time goes by…so yes, the template pretty much represents perfectly anything from Ultron to Skynet to A.M., up to 11. LOVE it! I’m so going to use this template in my conversion of Liberation of the Demon Slayer’s 6th level! Next up would be the Unbound (CR+1) template – which is nothing really new to me, alas. In 2nd edition’s brilliant Van Richten’s Guide to the Created, the Ravenloft supplement perfectly described the inherently problematic ramifications of binding an elemental (or spirit of the dead…) to a physical shell and basically, this one represents an elemental-themed representation of this trope. Okay, I guess, but ultimately neither regarding narrative, nor mechanics particularly novel. We close this book with the CR+2 Vivisector template…which actually gains a Con-score, while retaining all immunities, being a dread amalgam of flesh and inorganic material. This also makes them great infiltrators and creatures that can graft pieces of the dead to themselves, spontaneously animate objects and rip organs and limbs straight from the living to maintain its ever-decaying form. Flesh-golem serial killer? Heck yeah, why not! 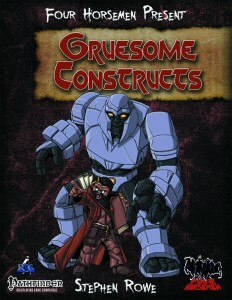 Stephen Rowe’s gruesome constructs represent a great collection of templates and in any other series, I’d be probably significantly more impressed by the content herein. Seeing the absolute brilliance exhibited in the last two installments, though, makes me ultimately consider this one to be a bit less awesome. While the Insane Intelligence is basically a brilliant module waiting to happen and while I love the shield guardian-inversion, both vivisector and unbound felt a bit less intriguing to me. On the plus-side, the vivisector’s mechanics are unique enough to render the templates take on the trope interesting…but the Unbound, try as I might, feels like bland filler to me – both in concept and execution. It is only due to the brilliance of the other pieces herein that I’m still going to round up from my final verdict of 4.5 stars. You can get this great little template-pdf here on OBS and here on d20pfsrd.com’s shop!